Live Demo & Source Code Download Explore our online demo for both frontend and admin sites. Install your own instance on Microsoft Cloud (Azure). Download complete source code. Documentation Technical documentation for developers that includes platform architecture description, API reference, recommendation for deployment and configuration, samples of modular plugin extensions and more. Case Studies Review how our partners and us are using Virto Commerce to create the most innovative solutions on the web. Code repository Explore latest production and development source code by subscribing to our GitHub repository. Platform Evolution Actual roadmap includes product development plans from virtocommerce team as well as from our partners. Blog Subscribe to our blog and get the latest news, developments plans, success stories and other virtocommerce related updates. 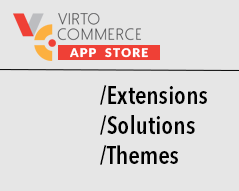 App store Explore our constantly growing store for new features, modules and services provided both by our Partner Community and Virto Commerce engineers. API Reference The REST API provides you with the ability to manage your modules by providing calls for working with resources.